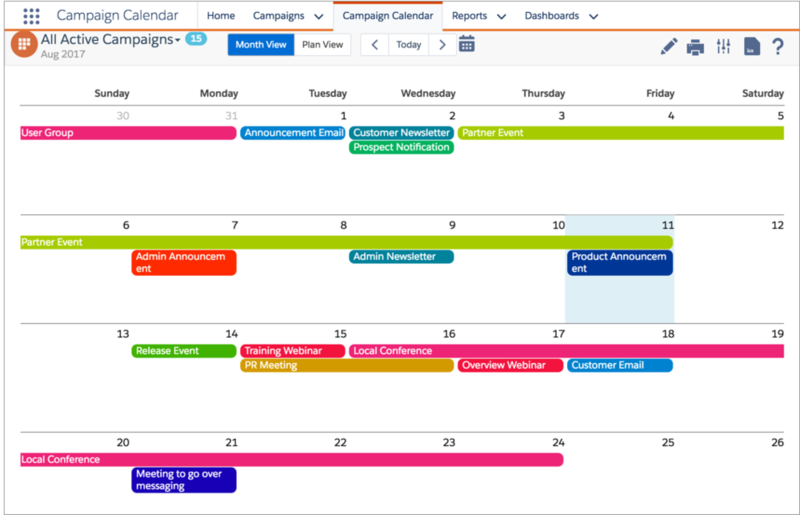 Campaign Calendar is a powerful Salesforce-native tool that helps teams streamline the management of marketing campaigns. At Bracket Labs, we highly value user experience, and we are always determined to look for ways to make our products better for you. With that in mind, Campaign Calendar has gotten an update! The primary goals of this release are to make Campaign Calendar fully Lightning Ready, to address a few bugs, and to give the app a facelift in terms of look and feel. Lightning Ready: All Campaign Calendar controls, elements, icons, and typography are consistent with the Salesforce Lightning principles, design language, and best practices. Color Coding Controls: Enhanced color coding controls. The application no longer presents an unintelligible Apex error when a user without Color Management permission tries to change color coding settings. Chatter: Chatter now has its own tab in Campaign Details pop-up window. Additionally, the Chatter Feed component has also been updated to feature all available functionality. Bug Fixes: Fixed a number of display and navigation defects. If you have any questions or would like to upgrade to the latest version of Campaign Calendar, please reach out to us at support@bracketlabs.com. When updating to this latest version we recommend that admins take the opportunity to review the permission set assignments for their users. Unless the organization has custom permission sets or profiles created with Campaign Calendar in mind, all users who access the Campaign Calendar app should have the packaged Standard Access permission set assigned to them. Additionally, any user who has the right to change company-wide color settings should have the packaged Color Management permission set assigned to them. If you are not currently using Campaign Calendar, we would love for you to give the app a try! Get started with a free 14-day trial and download Campaign Calendar on the AppExchange today.